Products for hair loss are a dime a dozen. On this page, I am going to review some simple strategies to treat baldness, and tell you about my own experience with saw palmetto for hair loss. Going forward I will look into hairloss products for women, as alopecia affects women as well as men. Baldness and hair loss are not one in the same. 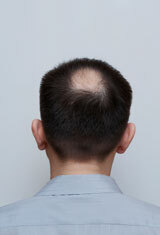 Baldness is what results from hair loss and it affects both men and women. There are many diseases and conditions, which can cause hair loss, but the most common is called androgenic alopecia. This most commonly affects men, but can affect women as well. It can be devastating as it can truly undermine your sense of attractiveness, self worth, and confidence. Hair loss is not life threatening nor does it limit your lifespan or activeness. However, it can affect you emotionally and tends to worsen with age, so I consider it an antiaging issue to treat baldness for this reason. I don’t have a cure for baldness, but I will share what I know with you, and update my information on this topic as I learn about new developments and products for hair loss. Many things can cause hair loss. 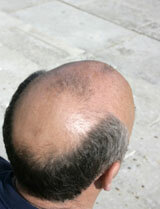 I have chosen to focus on the most common type for this page, which is male pattern baldness. This is a genetic trait that is passed down through the mother’s side of the family, and affects over 70% of men by age 80! A hormone called dihydrotestosterone, which is made by the body from testosterone, by an enzyme called 5-alpha reductase, causes this type of baldness. It causes the hair follicles in the front and crown area of your scalp to shrink by shortening the growth phase of the follicles. This only happens if you have the genetic trait for it! This eventually results in thinner and thinner hair until the follicle eventually stops producing hair all together and dies. Once the follicle stops producing hair, you cannot reverse the process and regenerate the follicle. This is a simplified version of the process. There are many resources online that go into this process in more depth, but if you have thinning hair due to male pattern baldness, you understand full well what you are facing and want to focus on a solution. Since pretty much everyone is familiar with wigs, I am not going to delve into that approach. Hair follicle transplantation has come a long way, but again that is a subject in an of itself. You could devote an entire website to cover all the products for hair loss. I am going to talk about my personal experience and what I found to be somewhat effective for my hair. You will of course need to experiment to find what works best for you, but use the information I am going to provide as a starting point. Before you embark upon a search for your own personal solution, you may want to track down a physician who specializes in this area, just to make sure you have correctly identified the reason for your hair loss, and can then pursue the most effective treatment. I have been gradually losing my hair since my late twenties. The fact that I still have considerable hair left is testament to the effectiveness of my own approach, although I haven’t been really aggressive in treating my own hair loss. I got really good results taking 3 soft gels 3 times per day, but that is not a magic number. You can experiment with the dosage and use just enough to get noticeable results. It is not a miracle, but I did notice a definite difference in the thickness of my hair. This was noticeable after a few weeks of taking it. Of all the products for hair loss that are taken internally, I found saw palmetto for hair loss to be the best for me personally. I combined it with using several shampoos to help control hair loss and treat baldness. The side benefit of using saw palmetto for hair loss is that it also helps keep your prostate healthy and has a protective effect against prostate enlargement and possibly even prostate cancer. This is a wonderful benefit and reason to try it. Saw palmetto acts in a way similar to the drugs Proscar and Propecia in combating the effects of DHT on the hair follicles, however saw palmetto for hair loss is a natural and safer alternative to drugs, and it does seem to work in the extract form that I mentioned. Nizoral anti dandruff shampoo contains ketoconazole, which is an anti-fungal and also has anti-androgenic properties. This means that it helps block the effects of DHT or Di-hydro-tesoterone, which cause the hair follicles to stop growing hair. Nizoral comes in two strengths, a 1% solution that you can buy over the counter, and a 2% solution available by prescription. You can also get the 2% from Canadian pharmacies on the Internet, and also on eBay. It is of course preferable to the weaker solution, as it contains 50% more ketoconazole. Nizoral is not a total solution by itself but should be used in combination with other products for hair loss. You should shampoo with it 2-4 times per week. On the other days you can use a product like Selsun Blue or Head and Shoulders, shampooing your hair as you normally would. These products contain potent anti-oxidants to reduce oxidation of the oils on your scalp. The may also have anti-inflammatory properties as Nizoral is reported to have. You may also want to experiment with shampoos containing polysorbate 80 as it is a surfactant, which cleans the oils from your scalp and helps promote new hair growth. It is the original main ingredient in products for hair loss such as New Generation and The Helsinki Formula. You can get polysorbate 80 on the Internet from online pharmacies and also on eBay. Minoxidil is one of the products for hair loss, that I have not tried. However, it is the only product, which the FDA recognizes to treat baldness. It can now be purchased over the counter as Rogain or the generic form in 2% or 5% solutions. It would seem logical that the 5% solution would be preferable, but again your own personal experience should be your guide. If the 2% works for you then you may not need the stronger solution. You can get Minoxidil on the Internet, or in most any drugstore. It is available most anywhere and relatively inexpensive. It is something you should definitely try along with the other products for hair loss that I mentioned above. As effective as Minoxidil is to treat baldness it should be combined with other products for hair loss, such as the anti-oxidant shampoos, polysorbate, and saw palmetto for hair loss. This multi product approach will work better than any one of them alone. The name of the game when dealing with hair loss is to be proactive. Do not wait until you are completely bald, because all of these products for hair loss work best if you start them early to treat baldness, before it gets out of hand. There are many products out there that may work quite well. As I go along and try other things myself, I will share my results with you. Hair loss is the one problem I am still trying to solve and when I do I will put all of the information on what worked for me on this site. Again let me briefly reiterate what I have done and found effective. Try these products for hair loss and combine as many of them as you can afford. I believe you will find them to be effective at stopping or slowing down further hair loss and allowing your hair to recover and become fuller and thicker.